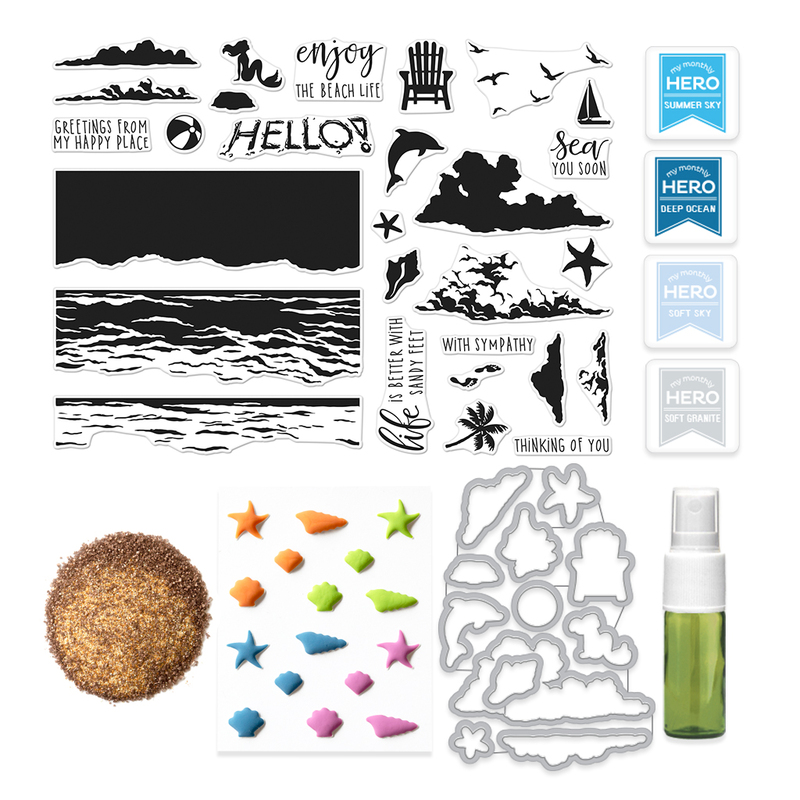 Today is the release of the June My Monthly Hero Kit over at Hero Arts. 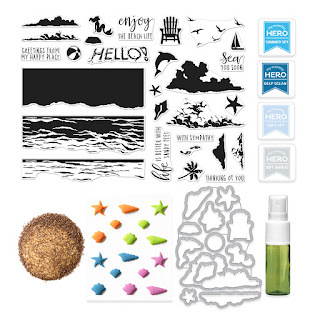 Each month, Hero Arts releases a kit full of stamps, dies, ink and paper. The perfect box to receive in the mail to create lots of cards! To start at the beginning of the hop, head over to the Hero Arts Blog. If you are already following along, you should have stopped in from Jenn's Blog! 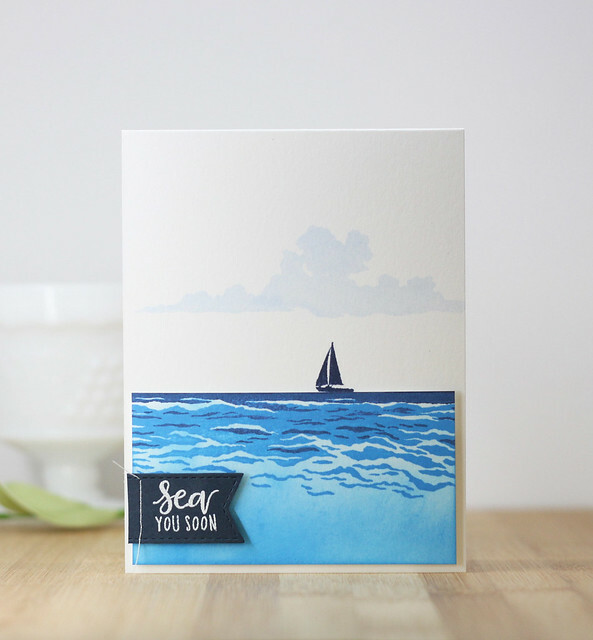 To create this card, I stamped the ocean scene along the bottom of a 4" card panel. When I stamped the darkest part of the horizon, I cut the panel at that point. 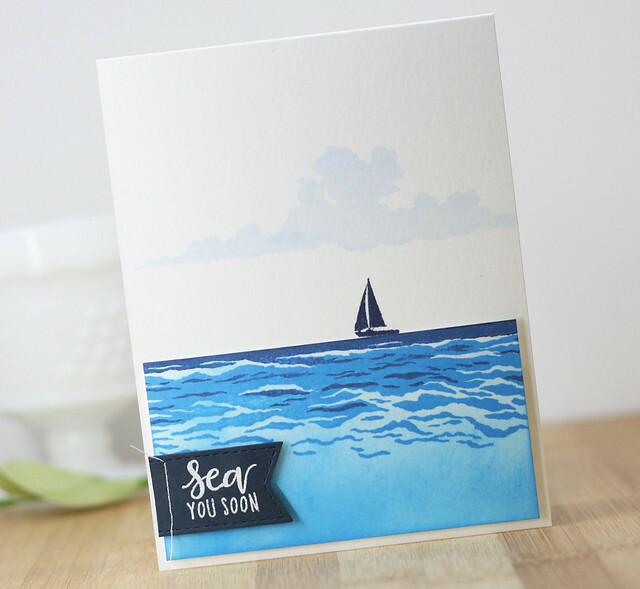 On the card base, I stamped one layer of a 2 layer cloud image and the little sail boat. I added the ocean scene to the card with fun foam so it would be popped up. I stamped the sentiment in Versamark on a little banner and then heat embossed it. I did a tiny bit of stitching and then added that to the card with foam tape. I have been on a couple cruises and stamping this amazing ocean scene made me think of being on a ship and looking out on to the horizon. I do love the ocean! This next card was super fun to make! Of course, for me, clean and simple and anything rainbow is the way to go! I hope you have enjoyed my cards today. 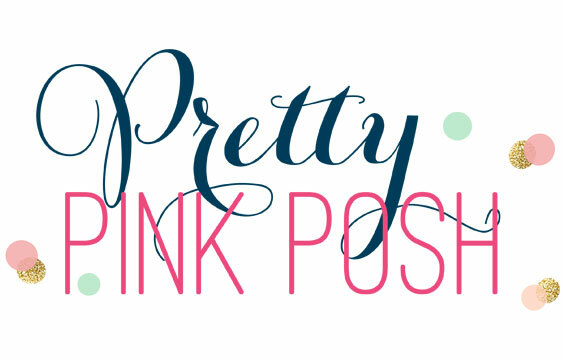 Check out the giveaway and the full blog hop details below. You're next stop is over to Lydia's blog! We are giving away one kit as a prize to one blog reader - selected from the comments across all of the blogs in the hop. The giveaway closes Sunday, June 10th at 11:59pm, and the winner will be announced the following week. So glad you stopped in today. Have a great day! Lovely cards. I love the beautiful blue color. Both wonderful cards but that first one is gorgeous and it really does look like the view from a cruise ship balcony! Love it! TFS! Lovely cards--I especially love the ocean scene! This kit is so amazing and thanks for sharing your cards - they made me smile! Love the beautiful sail boat and the colors so calming. The rainbow beach is awesome. Wonderful ideas! Thanks for sharing. Wonderful cards! And a wonderful kit! I live by the shore, and I'm always trying to make realistic looking waves on cards and layouts - these stamps are perfect! Your ocean looks very cool! I like the dark and light effect..
How cute! Love the rainbow on that background stamp! Your ocean is so cool! I just love how the waves build up to create those beautiful scenes! Love your cards! This is my favorite Hero Arts kit EVER! I have already placed an order for myself and my daughter. I can't wait to get my hands on it and play with it. The kit contents seem so well thought out. Looking forward to trying out the sand embossing powder. Beautiful! I love the peacefulness of the ocean scene and the bright color with the beachy background. I love the first one it makes me think of being in the marina looking out, and the second one is lovely too. Thanks for the inspiration! Nice work - love the cards. Take me to the beach! So beautiful. The ocean card is perfect! fabulous clean and simple design! Your card just make me feel relaxing! I gotta say they all look amazing! Amazing cards!! I just love the layered ocean stamps!! Beautiful cards. So ready for some beach time this summer! I knew I could count on you so I hit you up first on the hop. From peaceful to joyous and two beautiful cards! Just gorgeous. Two great clean and simple cards! I love the "Sea you soon" card. Typically I would have popped up the boat and clouds but I like the opposite effect. I'm going to give it a try! Love this CAS card... makes me miss being on a cruise ship; perfect mix of realistic and fun! Great job... must find these stamps! Beautiful cards, especially love this kit and the Beach bold prints background. These cards make me long for the beach and for summer to come! I had heard the kit is sold out already?? Very cute cards! Thank you for sharing! These are both so beautiful! Love the cool calmness of the first card and the rainbow fantastic-ness of the second! I really like the monochromatic card - beautiful! I love your cards. They are so beautiful. Thank you for this inspiration. I am so sad the kit sold out. Lovely, cool blues in the first card and such a fun second card! Gorgeous! Love the sailboat card! I love those two cards. 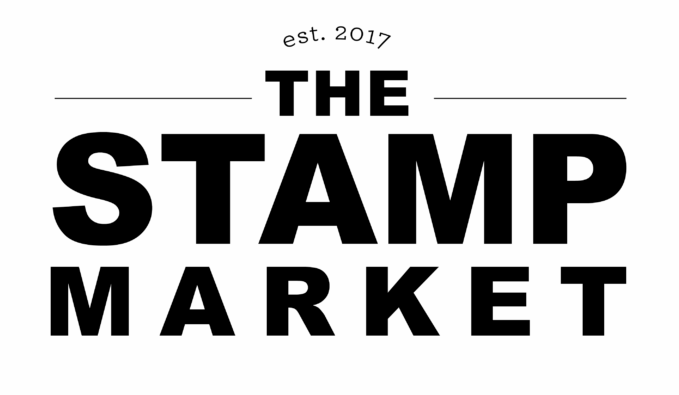 I got the big stamp and was wondering how I would use that on a card. Great suggestion. So sorry the kit is gone, but your cards are cute and inspiring! Beautiful use of the waves and cloud stamps. Gorgeous! TFS great ideas for this kit! This card kit makes me want to take a trip to the beach. The good thing is I only live a few hours from the ocean beach!!!!!!! Love love love the colorful umbrella card. Your first card is amazing! Love the whole layout and colors! Great cards! 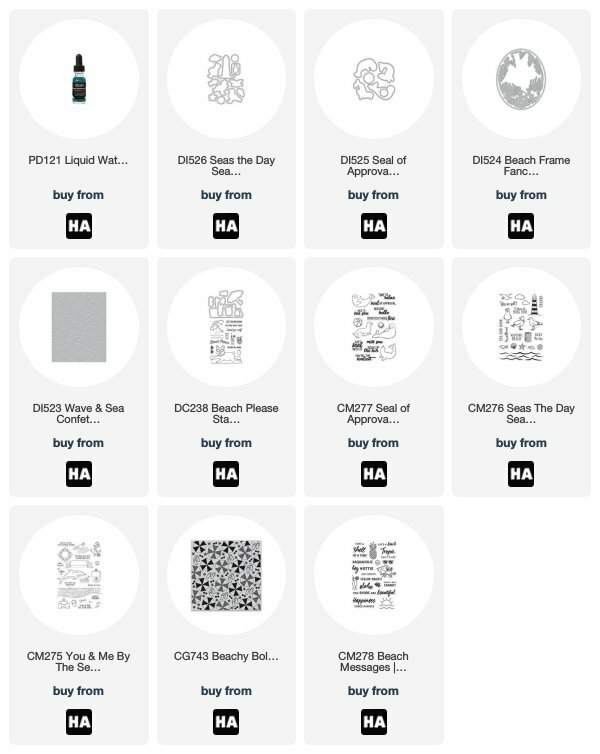 These stamps look like so much fun to create with. Love your cards! So much bright and pretty color on that background one with the beach umbrellas...I love it! thanks for sharing! Very nice cards! That beach scene is so peaceful. The rainbow card full of fun. I like how you used the background stamp on that rainbow card. Love the Sea Soon card! Love your creativity with this kit!! Beautiful cards! Fabulous cards! Gorgeous and fun. What fantastic inspiration. I'm like you...anything rainbow is a hit!! This kit inspires creativity. Beautiful cards with these fun new products. Thanks for the inspiration! LOVE these cards - thanks for the inspiration. I love this kit and what you've used looks so amazing. Hi, Cool cards, Your first card blew me away, the water looks so real it's amazing you rocked it!! Great post, This is a awesome kit, I really love this one and the add ons are also amazing. Thank you!! I think I like your first car best because it does remind me of being on a cruise… Looking at on the ocean! Well done! Beautiful summer cards! Love them!!! Just sweet cards Laurie and I esp. 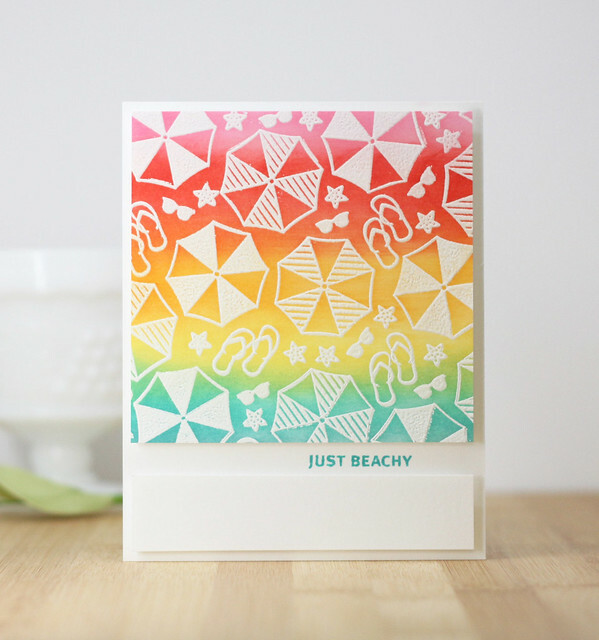 love the 'just beachy' card, so pretty. TFS! I love both of your cards! The rainbow umbrella one is so bright and colourful, I love it! Your card made me realize that there are many masculine cards that can be made with this new kit...yeah! Love both your cards...can't wait to get this kit. Thanks HA! I love your serene sailboat scene! And your second card is so much fun! Beautiful cards. Love the beach scene. Both cards are stunning! Loving the layering ocean and clouds stamps form this kit. man, I should have ordered that beachy bold print. I love that card! Your cards are wonderful and I hope to win this kit! Beautiful designs! I love all that fun color that pops right off the page! I loved your cards. The bold colors of your Beachy card is so playful. I liked the simplicity of your Sea you Soon card. I like cards that are quick and easy to make but also pop with the layering. Thanks for sharing. I like the stitching of the sentimentnon the first card. Very beautiful cards Laurie. Definitely love the soft sea scene. Reminds me of being at the ocean and seeing ships in the distance. Thanks for sharing them. I love the beach and this kit is so awesome. Your cards are great inspiration for making some cool beachy scenes! Love the beach and summer, your cards are gorgeous!! Thank you for sharing. Beautiful cards! This kit is awesome! Cute cards - love the rainbow one! Great cards. My fave is the first one with the sailboat--so peaceful. This kit looks excellent, great cards! Love the sailing card. So tranquil and calming. This kit and your cards are so fabulous. I can see so many different ways this kit can be used! 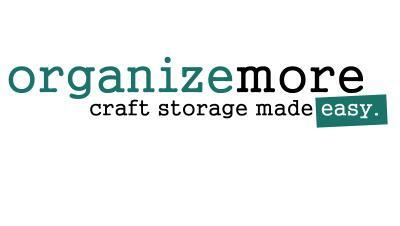 Such fabulous cards you've created! Such inspiration! Thank you for sharing! I absolutely love the paneling layout and the colors of that 2nd card!! Thank you for sharing. The stitching on the sentiment is a nice touch. Great cards, I must have the Beachy Bold background stamp. I so love this kit... I am so sad that it sold out already. Some of the add-on's are pretty great. Love the umbrellas. Nicely done. Both are nice, but that second one is fabulous. Love the beautiful colors. Great cards! I love the colors in the second card! Thanks for the inspiration! I love the little stitching element on your sentiment very creative and the other background card has such beautiful vibrant color. 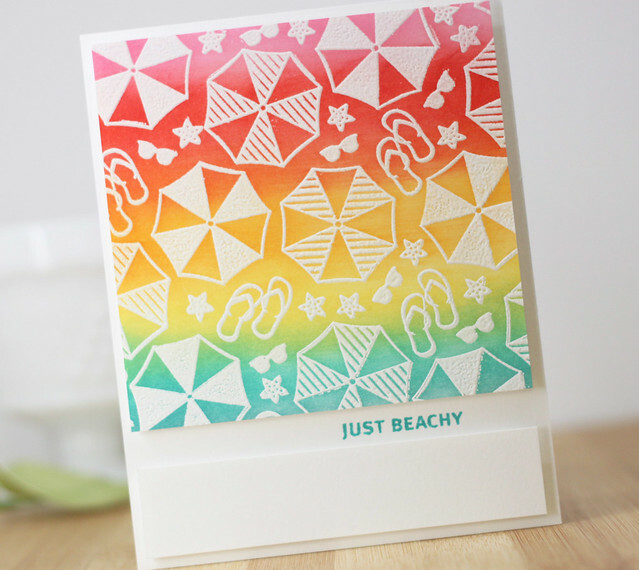 Love that rainbow goodness on your beachy bold card ❤️ This kit it magic! You made some beautiful cards !! There is always a rainbow on your page! thanks for sharing! Laurie! So cute. I love what you did with that background stamp! I am going to have to add that one to my "add-on" wishlist! Such lovely cards you have made from this terrific kit! Great job and thanks for the inspiration! Both cards are great, but the first is my fave! Fantastic cards! Love the ocean scene! Rainbow umbrellas...just awesome!! Loved all your ideas! Totally gorgeous, Laurie! I Loooove that beautiful CAS card with the super cool waves & the second one is just as beautiful. Love your designs! Great cards. Definitely one of the best card kits yet! What fun-in-the-sun beach cards! Nice bright colors and beautiful designs! I love this kit -- it is probably my favorite of all beach theme sets! Bright colours and bright ideas I love them. I’m obsessed with this kit! Love the products you came up with to use them! Great cards, I especially like all the blue tones of the first one. You are so lucky to now own those stamp sets!!! They are perfect IMO. As are your cards. The first could be the view out my folks' window. The second is fun factor to the nth degree. Love all the stamps in the release. The layering stamps for the sea are fabulous. Thanks for your beautiful, creative inspiration. Love your cards! There are so many great things for summer in this release! So lovely cards. Especially love the first one. Fantastic cards Laurie. Love the clean look of the first one... so serene and pretty. The second one is so bright and cheerful! Great white embossed images. :) Awesome kit! Awesome cards! Love the fun beach umbrellas! Fab card! Both of your cards are wonderful Laurie...that beachy one...gotta love the rainbow goodness! love your cards. So clean and fun. the other card is great too. Love these! The colors of umbrellas are very cheery and that ocean is fabulous! Great cards. I really like the sailboat scene. I watch the new release every month. This month I didn’t get to it until the third and by then it was already sold out. I’m heartbroken. I just opted out of this subscription last August. That was a big mistake. Great cards, more ideals on this Hero Arts June kit. This is a Great kit. That first card is so refreshing...makes me want to go to the shore! I just love both of these cards! The ocean is one of my favorite places to be-- I could stare at the waves for hours and be a happy girl! This has got to be the most beautiful kit ever!!! That embossing powder... Wow!!! Love your card! Great kit! Love your cards so much. And this kit...oh, this kit! Love the just beachy card. Your cards really make these products shine.